I’ve always been a hamburger purist. I gently shape the patty from unadulterated ground beef, season with salt and pan-fry or grill to medium-rare with a caramelized exterior. My burger motto: Don’t mess with perfection. Then Gordon Ramsay issued an intriguing challenge on “Hell’s Kitchen” — come up with a gourmet burger worthy of a $100 price tag on a fine-dining restaurant menu. Yes, the humble burger is fetching some serious cash these days. At Hubert Keller’s three Burger Bars, patrons pay $60 for the Rossini, a Kobe beef burger with sautéed foie gras and shaved truffles in Madeira sauce on an onion bun. The Double Truffle Burger occasionally available at Daniel Boulud’s DB Bistro Moderne in Manhattan is $120 and features ground sirloin stuffed with boneless short ribs with foie gras, preserved truffles and shaved fresh truffles. It comes with fresh horseradish and tomato confit on a Parmesan-poppy seed bun. I don’t think of any patty is worth $120, even made with Kobe beef and lavished with truffles and foie gras. But back to reality. While the five remaining contestants on “Hell’s Kitchen” worked on their burgers, I worked on mine in my head. It could not be a salmon burger. What was JaNel thinking? I’m glad she eventually won the whole shebang, but she bombed the burger challenge. Challenge winner Jon had the right idea with his Roman burger – start with ground beef, season it exquisitely and judiciously garnish. A few weeks later I finally made my own ultimate burger, and it was very good. Tony and I thought it the best we’d ever eaten. The seasoning was just so…so… what the heck did I put in that burger, anyway? I couldn’t remember. When I wanted to reprise it a week later for friends, I thawed out three of those leftover glorious burgers and tasted. Hmmm. What WAS that haunting, luscious flavor? I rifled through six shelves of spices, hauling out likely suspects. I did not want the burgers to taste like meat loaf. I added marjoram, mustard, Worcestershire sauce, garlic powder and sweet soy sauce, among other seasonings. I used 80/20 ground beef, not dryer chuck or sirloin. I shaped it into patties, then went to work on the homemade buns and toppings. In the end, my answer to Ramsay’s challenge was deeply seasoned slider patties on buttered and toasted homemade French bread, topped with mozzarella, pesto and slivered Vidalia onions. “These are the best hamburgers I’ve ever had,” my friend, Doris, said. I’ve tasted better. In fact, I tasted it a week ago. If I ever remember that recipe, I’ll share it. Meanwhile, I offer a recipe for last weekend’s attempt at the ultimate hamburger. If any of you have paid big bucks for a gourmet hamburger, please tell me what was in it and whether it was worth the money. And if any of you have created a praise-worth burger with suavely seasoned meat and interesting toppings, please share your recipe. This could be my summer of the burger. In a large bowl, combine ground beef, salt, garlic powder, marjoram, Worcestershire sauce, pepper, soy sauce and mustard. Combine thoroughly with hands. Shape into 20 patties about 3 inches in diameter. Sprinkle lightly with more salt. Grill hamburgers over a medium-hot charcoal fire until caramelized on both sides and medium to medium rare in the centers. Spread butter on both sides of each bread slice and grill or toast in toaster until they just begin to take on color. Place a burger on half of the bread slices. Top with mozzarella, then onions. 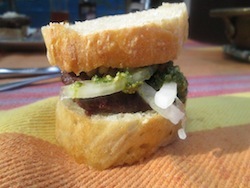 Spread about a teaspoon of pesto on remaining bread slices and place on top of burgers. The heat from the burgers with soften the mozzarella. Makes 20 sliders. Perhaps the most interesting food festival of the summer will be held this weekend in the Peninsula area. Farmers, craft brewers, historians and craft food vendors have combined forces to present farm tours, chef demonstrations, a farmers market, antique tractor and tool display, canning classes and more beginning at 9 a.m. Sunday, Aug. 4. The day begins with farm history displays at Heritage Farms on Riverview Road and includes 30-minute tours of five farms ($5 per farm per person); a food and farmers’ market from 11 a.m. to 4 p.m. at Bronson Church in Peninsula; a park ranger talk on the history of farms at 4:30 p.m. at the GAR Hall; special food samplings at various businesses; and a beer, wine and cheese tasting followed by a cooking demo and talk by chef Ben Bebenroth ($30) at the GAR Hall. The Local Food Fest is a joint production of the Peninsula Chamber of Commerce and Countryside Conservancy with support from local businesses. For full details, go to https://www.facebook.com/pages/Peninsula-Local-Food-Fest/490194031048824. The evening tasting and demo requires advance reservation. While visiting my cousin in North Carolina, we went to Lake Lure to the La Strada restaurant. They served shrimp with Pina Colada Caramel Dipping Sauce, which was excellent. We’ve been searching the web for something like it, but no luck. Have you heard of it? Do you know how to make it or something near to it? I brought some home (lasts two weeks in the fridge), but want to know how to replicate it. Let me know. Dear Cheryl: I had never heard of it, but then, I don’t dine at Red Lobster. Apparently the seafood chain serves shrimp with Pina Colada Dipping Sauce – no caramel, but close. I found the recipe below on several Internet sites. I know the restaurant you visited wasn’t a Red Lobster, so I’m also including a recipe I created several years ago for a really luscious pineapple-coconut-ginger dipping sauce for coconut shrimp. My sauce has caramel undertones. Mix pina colada mix, the 1/4-cup water, crushed pineapple, coconut, and powdered sugar in a sauce pan. Bring to a simmer over medium-low heat, stirring frequently. Let mixture simmer slowly for 10 to 12 minutes. Mix corn starch and water in a custard cup. Add to sauce and blend well. Simmer about 5 minutes longer, stirring frequently. Serve at room temperature. Combine all ingredients in a saucepan and bring to a simmer. Set aside to cool. Refrigerate several hours or up to 5 days. Serve cold or at room temperature. The Recipe may be halved. Regarding crème brulee: Since I happen to love it, and it was a particular favorite at a Portland, Ore. restaurant (long gone), I asked for the recipe and the chef’s hints on forming the sugar crust, which was much thicker than usual. His hint was forming and cooling the sugar disks on foil-lined baking sheets in egg rings that were a perfect fit for the ramekins holding the egg custard bases. The chef’s technique probably could be used with either the torch method or your alternative, though I used to have success just using my broiler. Dear Cindy: That reminds me of the miniature crème brulees I once had that were topped with chocolate disks instead of caramel. The bite-sized chocolate brulees were served warm, and the chocolate was placed on top at the last minute so it was just beginning to melt as you ate it. About those pesky birds eating your blackberries as they ripen: Dollar-store pinwheels and wind-spinners work. I have a horrible time with netting so I don’t use it any more. I find that keeping things moving scares the birds! I only lost a handful of blueberries this year because I hung the spinners on my bushes themselves on branches that stuck out further. Oh, and I was meaning to also say about the mowing of the garden? We’ve been doing that for years now. We even use a weed-whip around the plants. I learn something new every year. This year, it’s that broccoli and Brussels sprout plants look very, very similar, but Brussels sprouts have far more branches which, of course, need to be removed which I just did this morning. I wish you great gardening. Dear C.J. : I have to remove the branches from the Brussels sprouts? I had no idea. I seem to learn something new every week, thanks to friends like you.